2-My Feet Didn't Lie and my Nickel Said So! 8-Columns, Columns... Where Are You? New York City - Fifth Ave.
As built drawings are the foundation of all the work we do. 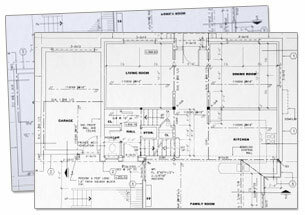 They start out as hand drawn field notes usually consisting of floor plan, plenum (above ceiling) plan, storefront elevation, storefront section, blow ups of critical areas, and electrical panel elevations. Many projects require full longitudinal and transverse building sections and a roof plan. One of the first things I do on site, after I do a walk around with existing drawings, is take photos. A good photo set is a huge part of an architectural site survey. Photos are the part that... show all tell all. Photos are the part than can provide answers to thousands of questions down the road as the job progresses. Photos are IMPORTANT! System identification is the most difficult of the three but one of the most important. Every space needs telephone, electricity, water, sewer, heating, cooling, and exhaust air. They may also need sprinkler, fire alarm, and smoke evacuation. 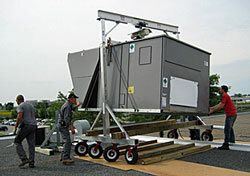 Some may need relief air, fresh air, natural gas, fiber optic, and an energy management system. Hello! I'm Rex Bernard. In my former life, I was a construction contractor for 20 years in my home state of Oklahoma. Following that, I provided architectural consulting exclusively for two nationally prominent firms for 15 years. Out of a long-time desire to incorporate new ideas for my clients' finished product, I established Rex Bernard Consulting, LLC in January 2014. The slider photos, at the top of this page, all contain a building or space that I have documented. 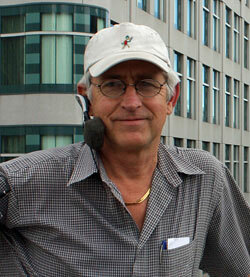 Over the years, I have worked in 46 states, Canada, and Puerto Rico. I have worked in all the major cities of our nation... multiple times. 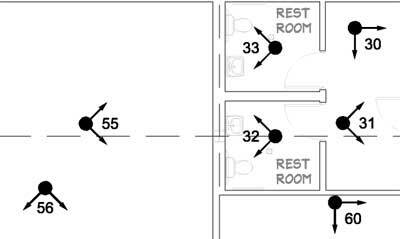 I have surveyed (documented) spaces in buildings as small as 1,000 square feet and as large as 175,000 square feet. Some spaces were as simple as a rectangle in a single level mall with plenty of light. Others were as complicated as an irregular pentagon multi-story historic building, in the cold of winter, in the dark, and with no heat. If you are a building owner, architect, or engineer who needs thorough and accurate as-built drawings, photo documentation, and system identification, please contact me for a quote. Why is Rex Bernard Consulting our best choice? Many architectural firms (and as-built drawing companies) have qualified CAD technicians in their office but don't have properly trained and experienced field personnel (called surveyors) to bring in the information. However... the field work is the most important because without thorough and accurate field notes, it is impossible for the CAD team to produce a good drawing. My job is a lot more than providing drawings, photos, and system identification. It is to be an investigator on behalf of the client to scope out anything that would cost them money when they build out the space. It is also to identify potential problems that can happen even after the space is built and the store or business is operating. To see an example of this, read this story: Just a Little Stain? I have over 15 years of survey experience. That combined with 20 years of construction contracting puts me in a position where I can offer architects and engineers something that is hard for them to find elsewhere. There are many kinds of architectural drawings. Most of them are drawings of what is planned to be built. As-built drawings are what is already there. They are drawings of the "existing conditions" of a building or space. Why are as-built drawings important? When a building is built using construction drawings, there are places where changes have to be made to make all things fit together. The changes are made during construction and usually don't get updated on the drawings. They may not be a big deal at the time, but years can go by and a new tenant, who only refers to the original construction drawings, may find unknown surprises when remodeling the space. These surprises could include things like significantly lower overhead pipes and ducts than expected, vertical pipes and chases passing through the space that are not on the drawings, an additional structural column falling inside a new proposed storefront opening, and many others. Who typically provides as-built drawings? Any architectural firm has the ability to produce as-built drawings. Many of them use their own staff when they have a need to accurately document the existing conditions of a building they are going to remodel. Also, there are companies who specialize in as-built drawings who are not architects but rather people, like myself, who are specialists in the industry. Photo documentation is systematically taking photos of everything in a space or building. It is photos of the floors, walls, ceilings, plenum (above ceiling), roof, equipment, etc. It is compiling all the photos in a photo album along with a photo tag plan that includes arrow icons to show where the photo was taken. Why is photo documentation important? Photo documentation is extremely important to any project because it allows architects, designers, and engineers in far away offices to see the project as if they were there. It is a visual, documented record of the existing conditions. They will refer to these photos numerous times as they proceed with construction drawings for the new space. Who typically provides photo documentation? As far as I know there is no other trade that provides complete photo documentation other than an architectural surveyor. System identification is getting the information about all the equipment that serves the space. It could be HVAC (heating, ventilation, and air conditioning), electrical, plumbing, elevators, escalators, powered doors, conveyor belts, sump pumps, water meters, etc. 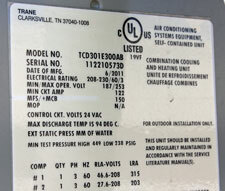 A surveyor will document identifying labels that have model numbers, serial numbers, manufacturing dates, and any other important information. Why is system identification important? Much of the equipment in a space can be re-used if it is new enough and in good shape. Identifying it properly gives engineers solid data to make those decisions. Even if the equipment cannot be reused, identifying the old equipment helps them to know how to proceed with new. Who typically provides system identification? The architectural surveyor is the initial inspector (like a primary care physician). Many times, the information provided by the surveyor is sufficient and the specialists can review it from off site. 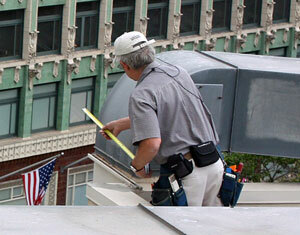 Some times, licensed engineers and other specialists go to the site to provide additional assessment and evaluation . Let's take an elevator for example. The surveyor will obtain the brand name and weight limit and note if the elevator is currently working along with its overall condition. If a client needs the elevator assessed or evaluated, an elevator company will be hired. They may check the motors, the cables, the electronics, etc. Most clients let the architectural surveyor identify the systems first and then go from there. They have found that this enables them to keep their costs down. What are your new ideas? I have felt the challenge in the last few years to make improvements to the basic static photo album which has not been keeping up with the current technology. So... I developed a "Project Album" that is iPad optimized and fully links between all the elements of the project: the compendium (survey report), the photos, and CAD drawings. I designed this project album to be used as easily on-site as in the office. Let's say you have one of our completed survey projects on your iPad and you want to view the photos in the plenum above the electrical room. You simply open the file, click on the Photo Map tab and then click on the arrow icon pointing to the electrical room. Instantly you are at that photo. 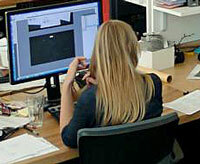 The older system, still being used, is one separate photo album that doesn't link, one separate survey form report, and a separate PDF of the CAD drawings. Anyone using this system can easily get frustrated trying to get around. As you can see, our iPad optimized Project Album is a great tool for building owners, architects and engineers. They like it because they have all the project information right at their fingertips in one album... and they can access it all very quickly! Can we hire local and save on travel expenses? Yes, you can, but every job you have in a different town will be done by a different contractor. That would be increased opportunity for miscommunication, insufficient training, and other problems. Most clients have a tight turnaround schedule and a high need for secrecy, accuracy, and dependability. They have learned that it is more cost effective for them to develop a long term relationship with a qualified consultant who is mindful of their needs even if that means paying for the travel expenses. When is the best time for you to do your job? Most clients choose to put me on site after their real estate team locates the space and obtains approval to tentatively proceed. It is before the final lease or purchase is signed.